Who wants to stay in a Bronze level if they can be Gold or VIP? Loyalty tiers are a great way to encourage your customers to repeat purchase! 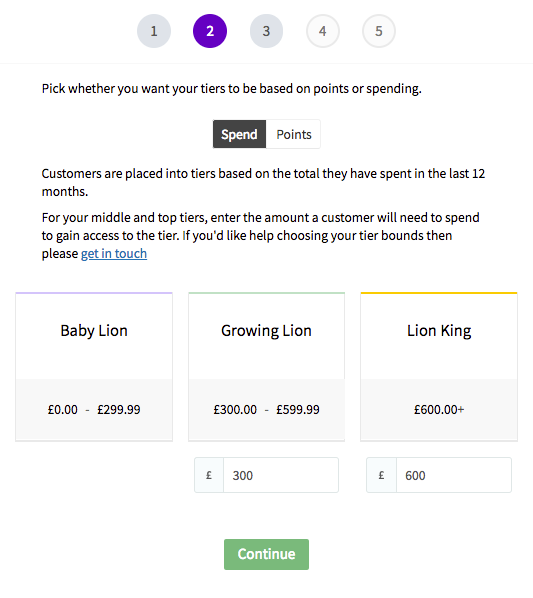 You can create up to four customisable tiers for your loyalty program. Each tier can provide bonus points for activities and also have exclusive rewards that can only be claimed when a customer is on that tier. If you'd like to use Loyalty Tiers, please contact your LoyaltyLion account manager for an onboarding call. The tier that a user is in is determined by how many *approved points a user has earned or how much they have spent in the last twelve months. When a user earns more points and moves over the boundary, e.g. from 299 to 300 points in the example below, they will move from the lowest tier to the middle tier. *User tiers are determined by approved points as opposed to current points - when a user spends points, this does not move them down a tier. If you want to make use of point-based tiers, simply change the slider from 'Spend' to 'Points'. Your boundaries will then change to points, which you can then set to be any value up to 999,999 points. SuccessTip: The higher the tier, the more points should be assigned to encourage customers to move up the tier. SuccessTip: The higher the tier, there should be a lower amount of points needed for each reward. Set up exclusive rewards only available for member in higher tiers - this way more customers will want to move up! 5. Ready to launch now (or later is also fine)! You can now edit your tiers pre-launch, simply by pressing the 'edit'' button shown below, found in your manage tiers interface. 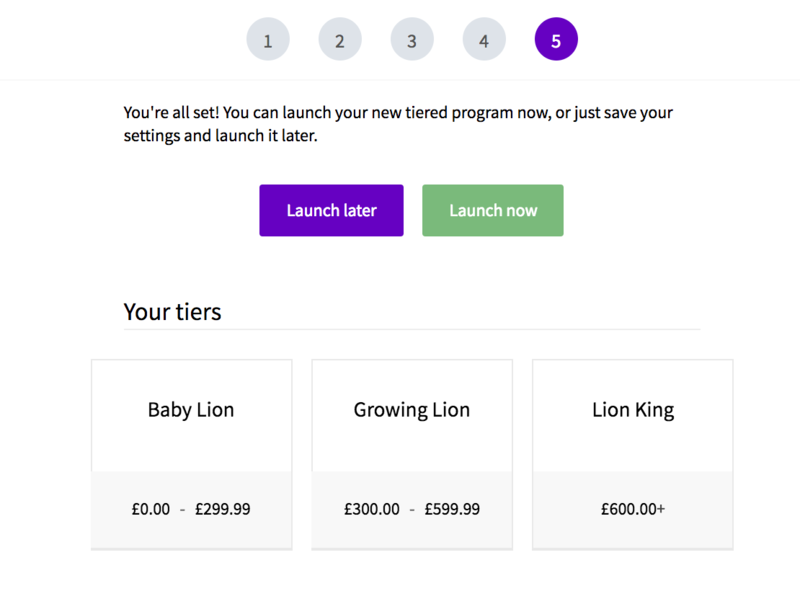 Please note, tiers can only be edited pre-launch, to make changes post-launch you will need to contact our support team for assistance at support@loyaltylion.com. Customers are placed into a tier based either on their total spend over the last 12 months or how many points they have earned over the last 12 months. If a customer has spent enough money or earned enough points in a 12 month period to move up a tier, we'll immediately move them up and let them know via an on-site notification. The customer will remain in that tier for a minimum of 12 months. When you launch your tiers, you have the option of starting them from today or making them retroactive. If you start them from today, all customers will begin in the lowest tier and we'll only consider purchases made or points earned from today when determining their tier. If you make them retroactive, we'll place customers in tiers based on their last 12 months of purchases or points earned; any customer placed in a tier this way will remain in that tier for at least 12 months. You can see a customer's current tier and how long they'll be in it for by viewing them in your LoyaltyLion members area. Once a customer has been in a tier for 12 months, we'll re-evaluate their total spend for the preceeding 12 months and either keep them in the same tier or move them down. If you move a customer to a tier manually, they are excluded from any automatic tier upgrades or downgrades until their manual membership runs out. This will let you set you program's tiers to a tier membership duration of 'forever'. It will in effect let you have the customer go up, but not down the tier effect. For example, if a customers moves up from Bronze to a Silver tier, they will never go down to a Bronze tier again. The customer will stay in the Silver tier until they spend enough/have enough points to move to a Gold tier. If you'd like to set Lifetime tiers please contact support@loyaltylion.com. During tier creation process you can mark tiers you create as 'hidden'. These tiers will never be visible to customers unless they are in one of those hidden tiers. Customers will never be moved to the hidden tier automatically, you have to do it yourself via the merchant account or API. 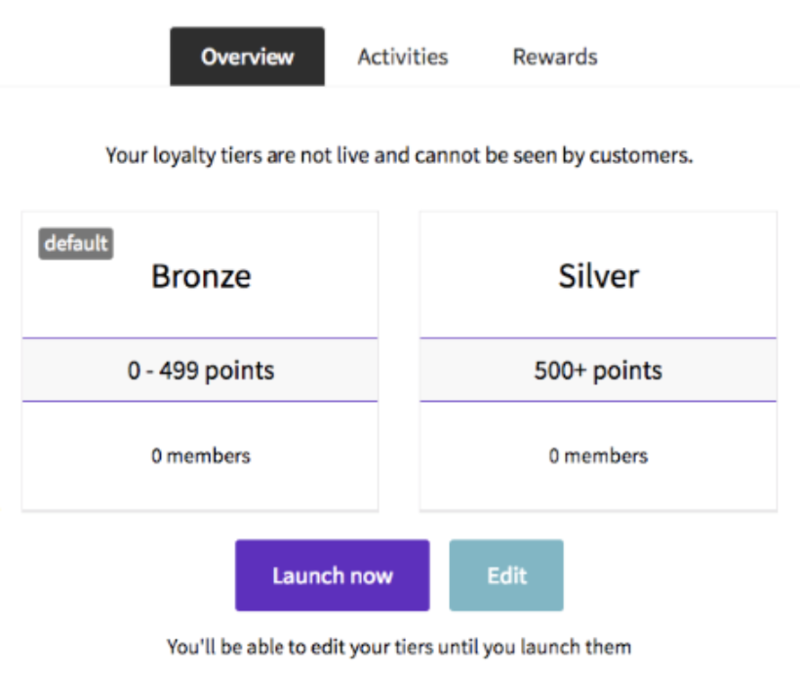 If all of your tiers are 'hidden', then no tiers are displayed in the loyalty panel and you can then use the tiers as your own customer segmentation tool. You can read about Hidden Tiers here. *Moving an unenrolled customer (guest/customer without account) into a tier with the API will be rejected. Can I change from monetary tiers to points tiers? Once you launch your tiers program, you can't make any changes. If you do want to completely close your current tiers program and go through the set up process again, please contact us at support@loyaltylion.com. Which platforms can use tiers? Tiers are not dependent on any platform-specific features, and so will work with all the platforms LoyaltyLion works on. How many tiers can a store have? What customisations are available for tiers? Each tier can be named and given a colour. Additional customisation can be done using the CSS editor. The availability and cost of rewards can be changed for each tier. This can be used to change the number of points provided by activities can be changed for each tier. How do tier memberships work? Can you give an example. Tier memberships work based on spend or approved points earned over a 12 month period. Each tier has a spending range, e.g. $0 - $99, $100 - $499, etc. We have a shopper who registers and spends $50 on day 1. She will be in the Bronze tier, as her spending has not reached the threshold for the Silver tier. On day 150 she spends an additional $75. As soon as she completes her purchase, she will be moved into the Silver tier, because her total spend in the last 12 months is now $125. If nothing else changes, she will remain in the Silver tier for 12 months, i.e. her Silver tier membership would expire on day 515. 1) She doesn't purchase again. On day 515 her Silver tier membership will expire and she'll be moved back into the Bronze tier. 2) On day 250 she spends $400. She will now be moved into the Gold tier as her total spend in the last 12 months is now $525. She will remain in the Gold tier for 12 months. 3) Let's assume that the shopper then stays in the Gold tier for 12 months (days 250 - 615) and during that period spends $200 on day 500. On day 615 her Gold tier membership will expire because she will have only spent $200, not the $500 needed to be in the top tier. Our shopper will then be moved into the Silver tier because her spend in the last twelve months is $200, in the $100 - $499 range. She will remain in the Silver tier for a further 12 months, until day 980. How does a shopper see what tier they are in? 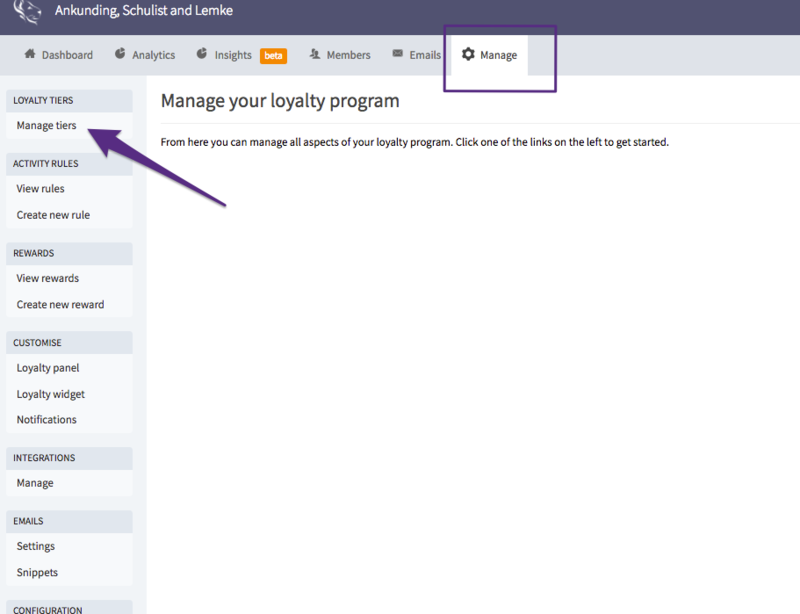 The shopper's current tier is visible in the sidebar of the Loyalty Panel, and also on the Tiers page. They will also see an on-site notification telling them when they have been upgraded into a new tier (we don't notify them if they are moved down a tier). How does a merchant see what tier a shopper is in? 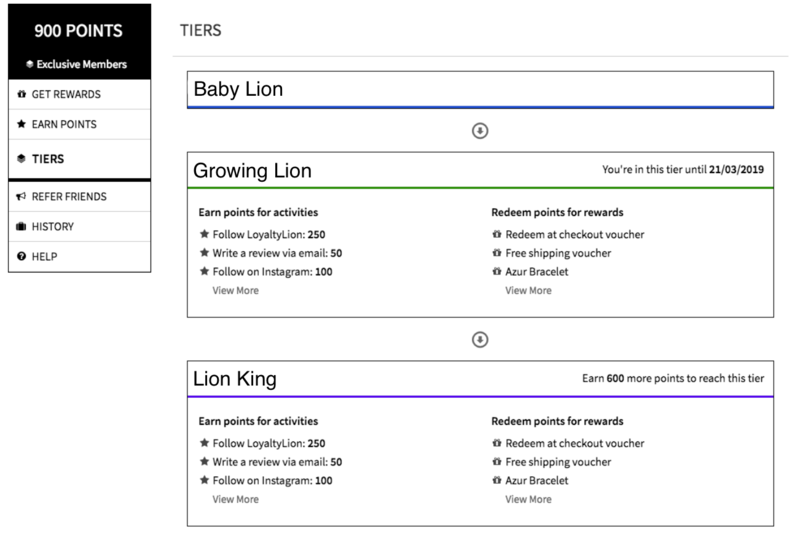 A shopper's tier is shown on their member page in LoyaltyLion along with the date their tier membership will expire. The customers moved into tiers manually will not have their tier changed until their current membership is expired - they won't get upgraded based on spend, like it happens normally. Are there any Loyalty Emails for tiers? Nope. However, we will be pushing tier information to our mail integrations (dotmailer, etc), so a store will be able to use that information to personalise their emails, or send emails to shoppers in a specific tier. Can the tiers be modified once they're launched? The costs of rewards/points given for activities can be changed. The boundaries (what you need to spend to make it into a tier) can't be changed without deleting and re-creating the tiers. 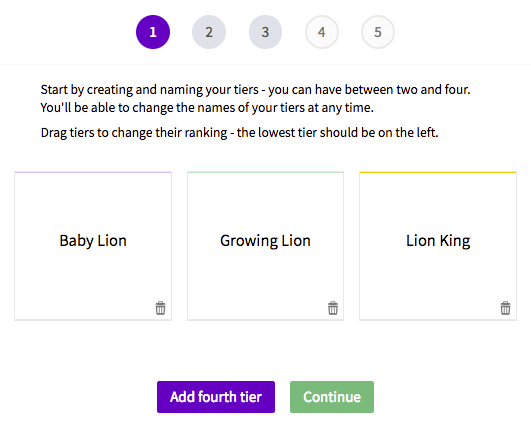 Contact support@loyaltylion.com if you want to rename or change tiers settings. Will the guest shoppers be placed in tiers? No, they will only be placed in a tier once they sign up. When they create an account we will look at the past 12 months prior points / spend do count for tier eligibility (regardless of if you were a guest at the time) if the reward historic purchases were on.